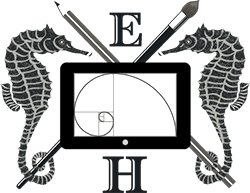 Building on brand, smart communications that speak to the customer and work for the client. Leading a luxury brand with creative direction. The Creative Lab at AutoPoint was awarded the opportunity to develop the Mercedes-Benz National Service Journey in partnership with their agency of record, Merkley & Partners. This required the development of a print, email and digital ad service journey that fit tightly within the MBUSA brand standards. The 34 communication journey needed to convey a luxury feel but also retail some personality for the customer. 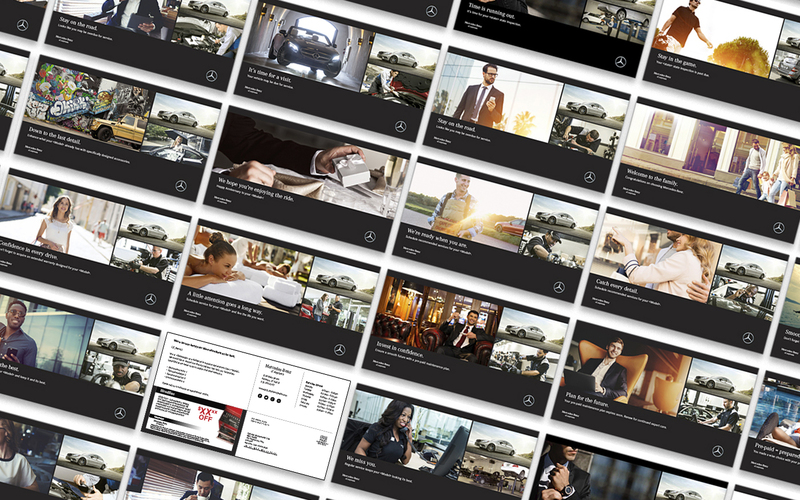 We accomplished this by using a triad image system encompassing an image of the customer’s vehicle, Mercedes-Benz service image and a luxury lifestyle image relating to smart communication messaging. Other advanced solutions for the program were the implementation of HTML5 ads for motion and variability, HTML brand font in email, and fluid layout for responsive email. On brand, on target and outperforming previous campaigns over 3 to 1. Use of large typographic headline reinforces message and brand through tone, saturation, font and texture in a cohesive design system across media. Impactful, close-up imagery is also on brand and helps to communicate message and connect with customer on a personal level. Designing smart, modular, highly variable layouts to save on costs and time. At its core, the designs for this program needed to meet brand guidelines for all major automotive co-op compliance programs and communicate clearly with customers enrolled in our sales journey. 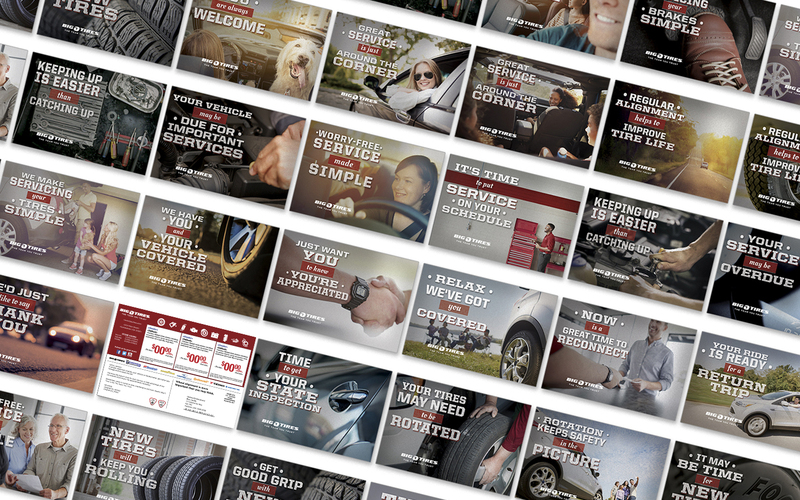 The design solution required variability for brand, dealer, customer information and vehicle imagery without sacrificing brand attributes such as color, font, layout and imagery requirements. 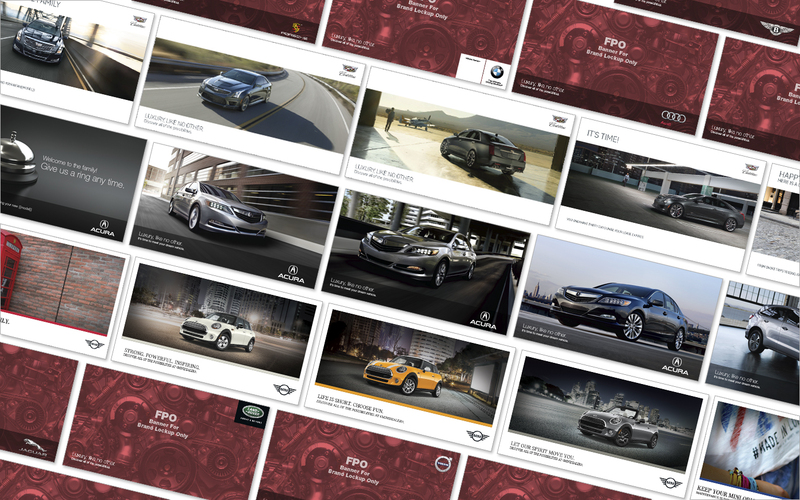 This was accomplished through a modular design system that allowed for multiple layouts per offer types and brand specific imagery that was selected through our data system to automate image generation for each brand and vehicle catalog asset. Custom headlines per brand tone and syntax were developed at help communicate a clear brand voice in the messaging.